Making your own duds and stuff for the home is a great way to save money and reduce the use of manufacturing resources. Especially when you're using eco-friendly textiles like organic cotton, peace silk, eco-wool or hemp. Even more so if you use reclaimed fabrics. There are even sewing patterns that are made sustainably -- like the patterns by Amy Butler. I saw this adorable tunic/top pattern today (at Fiber Notion, you can get it here). I don't think I'm skilled enough to make this yet, I just sort of dabble infrequently in sewing projects. 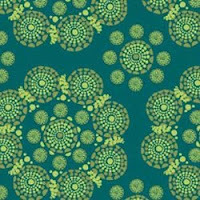 But I'm going to get some practice, 'cause this pattern is seriously cute. It's also made with 100% post-consumer recycled paper without chlorine bleaching. 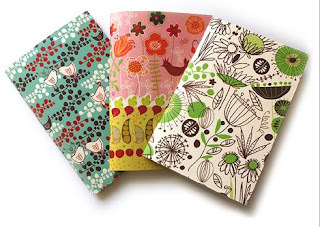 I came across these adorable pocket-sized "garden" notebooks today by ecojot while at an equally cute little shop in Park Slope called Fiber Notion. The notebooks are made of 100% post-consumer recycled paper in Canada (sweatshop free!) and the covers come in a range of great themes designed by Carolyn Gavin. The dyes are vegetable based and the recycled paper is chlorine- and acid-free. Plus the mill they're made in is landfill-gas powered. And to top it off, proceeds from the notebooks go to Evergreen, a non-profit group that introduces healthy and sustainable living to outdoor urban environments. These little puppies are great for throwing in your bag, especially if you do your best thinking on the go. I haven't been able to find these exact notebooks online, but you can get other notebooks by ecojot here. Brick-and-mortar shops that carry them include Anthropologie, The Container Store, and Kate's Paperie.